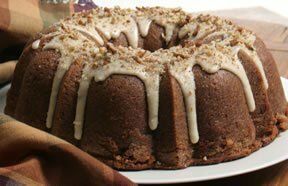 Made with shredded apples, this spiced Bundt cake has a moist, dense texture and is loaded with flavor. This Bundt cake recipe is a delicious way to appreciate the fall harvest of apples. It makes a great finish to any meal or you can enjoy it any time served with a hot cup of coffee. See how easy it is to make homemade apple butter to enjoy throughout the year using a slow cooker. Use green tomatoes to make a tangy-flavored and crunchy textured side dish that goes great with any meal.